A Note for Team Tesch: Criticism of your video, your website, your public comments, newsletter, and promotional tactics is protected under Fair Use of U.S. copyright law. I have the legal right to use portions of that video and quotations and screencaps from your websites for the purposes of both critique and parody, and I will use that right. However, if you would like to post any sort of response or rebuttal to my comments, you are welcome to do so. In the interest of fairness, I will publish them, complete and unabridged, alongside my own comments. Alternately, you can publish them on your own website and I will happily link to them. Gloria Tesch, as you are probably aware, wrote Maradonia and the Seven Bridges at age 13. Being blessed with parents even richer than Christopher Paolini’s, her book was promptly self-published, sending her spiraling downward into a tailspin of egotistical narcissism and self-delusion. And yes – her book is most certainly self-published. The publisher is listed as Liberty’s Book Press. Google it. They’ve published Maradonia, and nothing else. This quote is taken from a comment left on a YouTube video criticizing Gloria Tesch (the video has since been removed due to a copyright claim filed by Team Tesch). One of these comments was signed “AF”, and they mentioned that if you wanted to find out more about him, to follow the link to Tesch’s website. This strongly indicates they were left by Andrew Fisher, who designed Tesch’s website. I have to agree with Fisher’s assessment. Like Robert Stanek, Tesch began trying to publicize her book through internet sockpuppetry. Unlike Robert Stanek, she wasn’t very successful at it. For awhile, she spammed Yahoo Answers trying to pass herself off as the World’s Youngest Novelist, which is demonstratively untrue. When critics pointed out that other authors had published books at a younger age, Tesch responded by saying she was the youngest “real” novelist because her books were 800 pages long, which in hindsight is rather funny after she re-released the Maradonia trilogy by splitting each of the books in half and turning it into a six-book series. This is also funny because the real reason for the books’ high page count is their enormous font sizes, large margins, random gaps in the text, and short chapters which pad the page count considerably. More importantly, Tesch is not a real novelist because her books were never actually published – they were self-published through a vanity press. In the past, many critics, and I admit I have been one of them, have cheerfully assigned much of the blame to Gloria Tesch herself. However, I have amended my opinion, now choosing to assign much of the blame to Tesch’s parents. While I’m certainly in favor of parents encouraging their children, I’m also in favor of parents keeping their children honest and helping them improve their writing and maintain humility. If one’s parents proclaim one a child prodigy, and shelter one from all forms of criticism, what motivation does one have to improve one’s writing? Absolutely none. 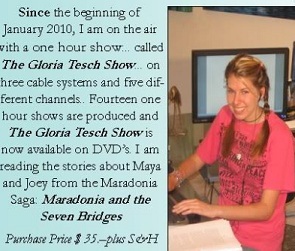 Tesch’s parents have been throwing money at Gloria’s writing since she started. And because of this, Tesch has kept on going under the belief that her writing is brilliant and she has hundreds of fans…although I have not seen any evidence that she has any fans. I have been unable to find a single fan website anywhere on the internet. Tesch’s reviews are also problematic. The reviews on Amazon are absolutely vicious, and deservedly so. However, Tesch’s website has a number of very good reviews on it. Several of these are from Leah Dallaire. Notice the last line: “humbled to be a part of this” – strong indication that she is not just a reader. She’s on Team Tesch. For a page on Tesch’s website devoted to reader reviews, why would you put up two different reviews of the exact same book by the exact same person…unless you didn’t have very many good reviews to put up in the first place? Dallaire’s other review is a copy of the review that she put on Amazon, where it is one of the two five-star reviews of Maradonia and the Seven Bridges. I suspect that a book’s editor putting up a glowing review of a book on Amazon is against the site’s terms and conditions. It’s certainly morally bankrupt. Again, note the comment about how she’s on Gloria’s “team”. Tesch also claimed, repeatedly, to have her very own television show. As swankivy and others have noted, Gloria’s television show is public access, meaning it’s available to anyone who can purchase space. If I purchased public access TV, I could spend an hour showing a tape of me knitting a scarf, and no one would care. However, it would still probably be more interesting than The Gloria Tesch Show, which is really just a camera on Tesch sitting there reading stories out of her book. Despite listing the show as being for sale, as far as I know no copies were ever actually produced. At least one person who ordered the television show received a copy of Maradonia and the Law of Blood instead. Even more interesting, several members of Anti-Shurtugal attempted to watch the show during times Tesch claimed it was being broadcast and were not ever able to find it on the air. 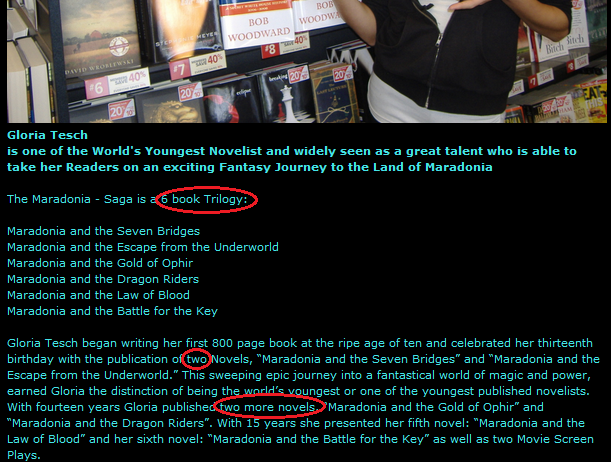 “The Maradonia Novel Stands Out!” (pictures and caption from Tesch’s Myspace. You’re right, Tesch. It does stand out. 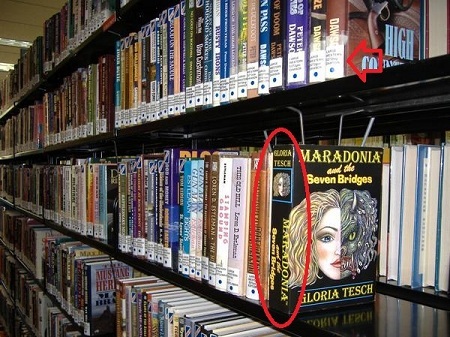 Could that be because every single other book on the shelf has a library tag on it and Maradonia doesn’t? It couldn’t be that you just stuck it there on the shelf and then snapped a quick picture of it, right? After all, what would be the point of that? No, seriously, what would be the point of that? I’d like to draw your attention to several things. First, notice the bestseller rankings. Notice that #6, #7, and #8 all have different books above each one. 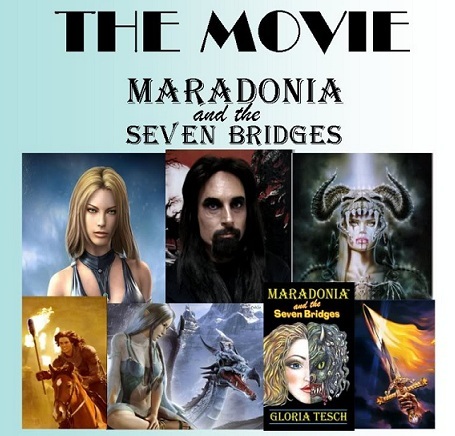 And notice that Tesch is apparently trying to claim that Maradonia and the Seven Bridges is the #1, #2, and #3 bestselling books…all at the same time. I’d also like you to note that every one of these books has a 40% off sticker on it, which is a special that this particular chain is running. 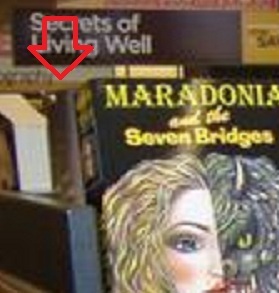 And, just in case you weren’t already fully convinced that Tesch waltzed into a bookstore, stuck a few copies of her book on a shelf, and had someone take a picture of it, let’s zoom in for a closer look at the book on the left. The book behind it is a completely different book. Tesch is currently laboring under the delusion that there will be a Maradonia theme park, which I think it’s best to just ignore, but more interestingly, she and her family are currently trying to secure financing to produce a low-budget Maradonia movie, for which Gloria Tesch has written the script. For a short while, Bowman had apparently been replaced by Evan Zissimopulos, who was also gone as of two weeks later. There’s no director listed on the official site, which is a problem, considering production has begun. I’m not exactly an expert on filmmaking, although I do happen to know quite a bit more about it than Gloria Tesch. For instance, I find it odd that film production crews would need to ask fans in a newsletter if they have a van or car they could lend out for their prep crew. Is that really what seasoned professionals do? 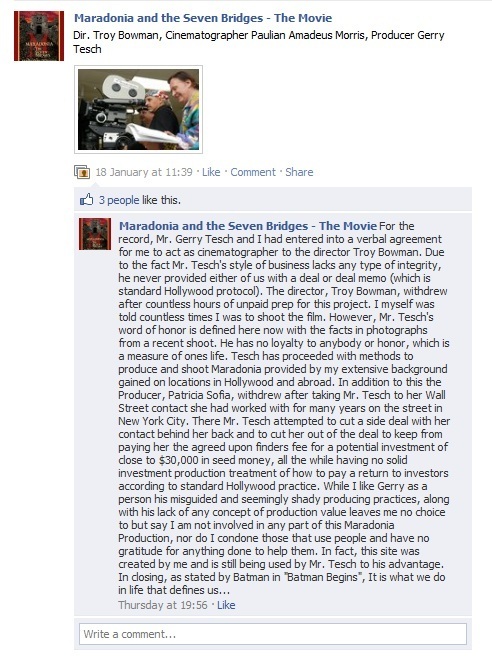 Also, you haven’t even announced your cast yet and yet you expect the movie to be finished by the end of of April 2011? I will agree that the Tesch publicity machine of the past was an absolute fiasco, but I’m now on board to move things forward with a bit more dignity, (at least you don’t have my job). The initial books are also being re-edited so that the stories can be enjoyed as they were intended. One of these videos was by the wonderful swankivy (you can read her writeup of the incident here, although you will need to be a member of the Anti-Shurtugal LJ community). Swankivy reposted her video, minus any clips from Tesch’s book trailer or screenshots from Tesch’s website, and I strongly recommend you watch it. This, as Team Tesch will shortly learn, was a very poor decision. You cannot silence criticism, and the more you try, the more ammunition it gives your critics. From Tesch’s Myspace. It’s still up. So…let’s dig into this book trailer. On Yahoo!Answers, they have recently changed the profiles from “the pulse” to this new layout. I just took another look at the library shelf photo. The titles are blurry, but it looks like the books next to Tesch’s books are by Loren D. Estleman, who, according to Wikipedia, writes detective fiction and western fiction. Most of the books nearby appear to be of latter variety. So either the librarian had a brainfart, momentarily forgot how to alphabetise, and put the book in a completely wrong shelf in a completely wrong genre section without a proper tag… or Tesch just randomly shoved the book somewhere and snapped a picture. Having met a few librarians, I don’t think the former is too likely. Troy Bownman used a Batman quote to bash Team Tesch ?! I don’t know who he is, but I love him. I checked out the link to the Independent, about the 6-year-old boy who published a book. The boy’s father’s name is Theodore Beale. I double-checked, and yup, it’s this same guy: https://rationalwiki.org/wiki/Theodore_Beale. As well as being a racist, misogynistic, homophobic and all-around hateful piece of trash, he’s a liar who artificially inflates his sales figures, and he owns his own publishing house (meaning that his son’s work was not professionally published). I would take any claims he makes with a very, very large grain of salt.